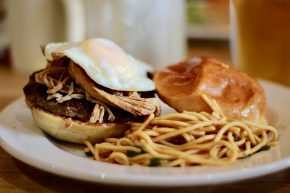 By far, the best unvegan option on the menu was the Farmhand Burger, made with local beef, pulled pork, bacon-tomato jam and a fried egg. As the farm doesn’t have a deep fryer, they do a rotating menu of sides instead and on this day I went with the spicy peanut noodles. The burger was a beauty and had a nice balance of the ingredients despite weirdly not having cheese. I found the pulled pork to be a bit dry, but that was possibly because it had been pulled off a squealing pig moments earlier. Aside from that, there was nothing I could conceivably complain about. In fact, I can even do the opposite and proclaim that more restaurants need sides like spicy peanut noodles to go with their burgers and whatnot. Seriously, there are enough fries, salads and slaws out there that the side game could use some real disrupting. Who’s with me? Anyone? I should also add that Pond Hill Farm is more than just a place to grab a burger carved right off of a cow. There’s a petting zoo, playground and other fun family activities, with vineyards in the works. So go for that, but definitely stay for a bite of the good stuff.